In this blog post you will learn 3 simple strategies to reduce neck pain. “Sit up tall, keep your shoulders back and don’t slouch. These are all too common phrases thrown around when discussing posture, especially around the upper back and neck. If you work at a desk for long periods of time you may find yourself inevitably slouching towards your computer screen. Upper back and neck pain is a common complaint experienced by most people at some point in their lives. Spending endless hours sitting behind a desk can exacerbate these issues. This can typically happen to muscles on different sides of the joint; the constant posture we remain in keep some muscles short and tight and the others long a weak – inevitably we end up with a muscle imbalance. 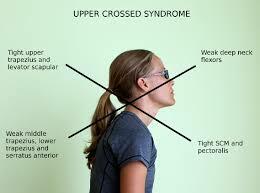 Upper cross syndrome is characterised by a forward head position, kyphotic (rounded) upper back, excessive upper neck extension and excessive protracted (rolled forward) shoulder blades. Essentially when this happens we end up with those muscle imbalances we spoke about earlier. How do you treat upper neck pain? Tip # 2: Alternate between sitting upright and slouching! While it is important to walk and sit with ‘ good posture’, it is not good to remain rigid and fixed in one position for the entire day. If you remain completely upright the entire day than your muscles can become even more rigid and stiff and contribute to more pain. Try this instead: Think about sitting up or standing up tall with your shoulders pulled back and relaxed. Keep your head stacked over you chest and don’t let it come forward. Then periodically throughout the day allow yourself to slouch for no longer than 10 minutes and then recover to a more upright position. Step 3: Strengthen – From long and weak to strong! 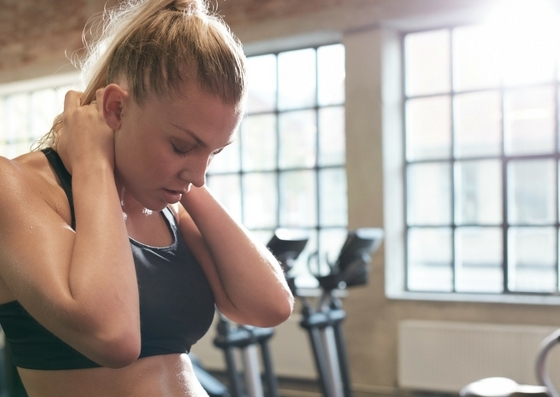 Lets just keep this simple and focus on the main muscles that we need to strengthen – “remember a muscle kept at long lengths is a weak one” – so therefore we want to strengthen that muscles in a shorter position. What is causing your neck pain – This will stream line your treatment and make your treatment as quick as possible. The 3 best self management techniques for you to keep your neck and back pain away for good. Leave the session with the confidence in knowing exactly what to do to get relief of your neck pain for good – FINALLY!